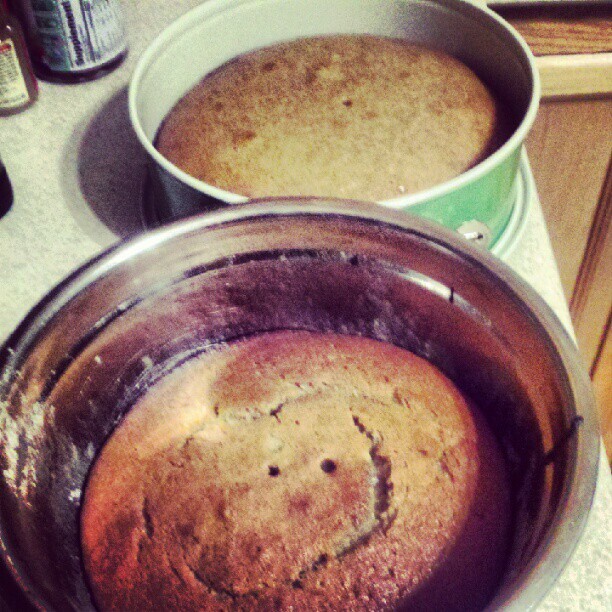 So I kind of love to bake…I’m pretty sure I’ve said it before, but I bake every week. It’s a pass-time of mine. So the idea had crossed my mind to bake some sort of cake of my own for the wedding. I quickly dismissed the thought because if it didn’t turn out, I would never forgive myself. However, after speaking with the venue/caterer people, and their statement that a cake would drive the cost of the food up, I began to reconsider the idea. I had always wanted a wedding cake, and wedding cupcakes just didn’t seem to cut it for me. If I could just have a little cake, maybe just something for us to cut into, that would be awesome. So I formulated an idea. Click the photo for an awesome How-To! Click the picture for the full recipe! That way, it’s a cute little hive with honey bees, surrounded by a cupcake flower garden! Perfect right? Sure…if I could actually pull it off. The only cakes I’ve ever made are round. 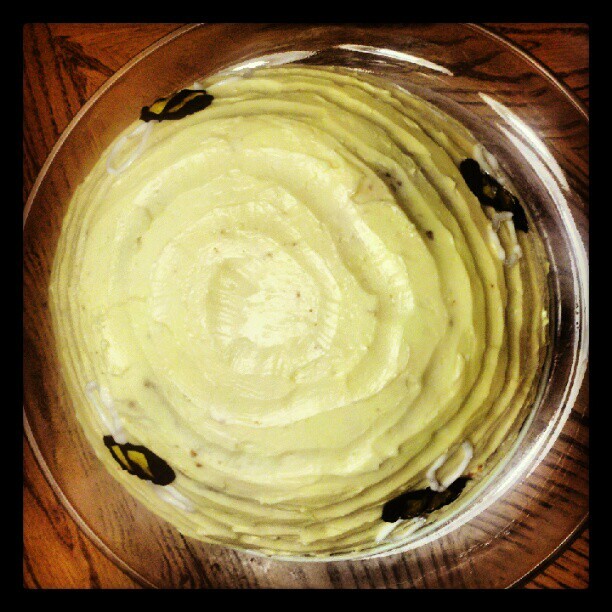 I don’t do cakes shaped like things…mostly because I’d screw it up royally. I tried a fondant cake once…that did not end well. But for the sake of experiment to see if I could, and for the joy of you all out there, I tried it. The cake itself is a honey banana cake. It tastes like banana bread, which I love, so no problem there. 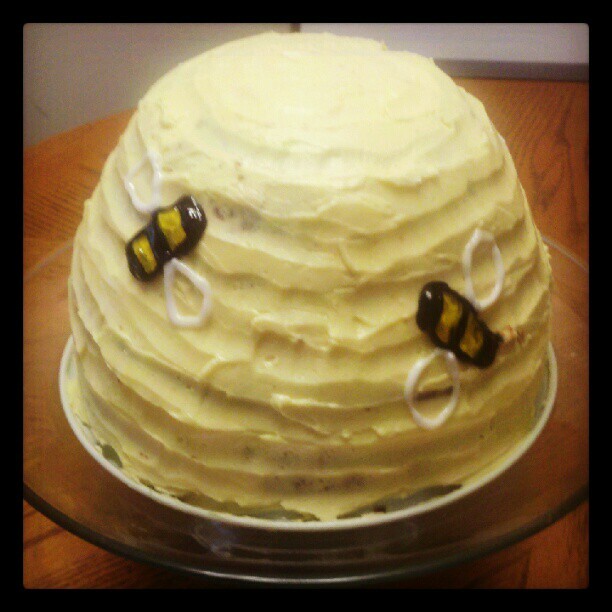 Part of the cake is baked in a pan, but to create the “hive look” the other part is cooked in a bowl. The bowl takes about 10-15 minutes longer to cook, but they both came out splendidly. And, as with all my cakes, they sit in the fridge over night. This helps solidify and cool the cake, and actually locks in moisture! Refrigerating tip courtesy of Paula Deen, so you know it works! The next day, it was onto tackling the buttercream frosting. This is real buttercream folks, not that powdered sugar crap that tastes artificial. 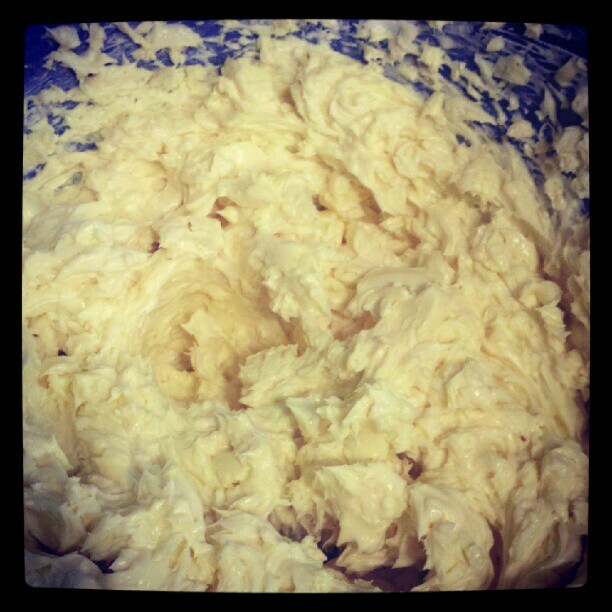 And apparently for real buttercream you need about 6 sticks of butter. 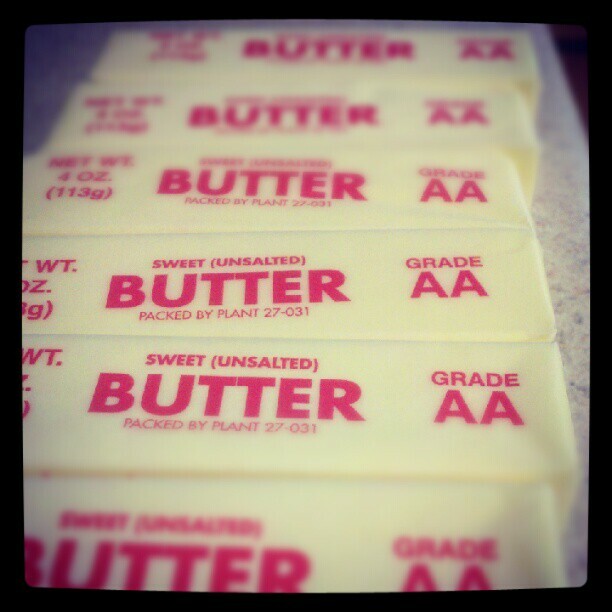 For this whole cake process I needed a total of 8 sticks of butter…that’s FOUR CUPS of butter. Talk about adding to the thighs! It looks NOTHING like the professional picture, and yet I am happy with it. I accomplished what I set out to do, and now I know I can do it. It looks homemade, which is the look we are going for anyway. So right now I am seriously looking at the idea of making this cake. I will do many more runs of this in the future, probably trying out different flavors of cake to see what we like best. What do you think? Has anyone else made their own cake? Sound off brides-to be! Would you ever attempt this to save money? That is super cute! I never thought about using a bowl like that to bake a cake before! And I also was not into baking like this before I was married. I do make my kiddos birthday cakes and try to make them fun. My most recent was a Very Hungry Caterpillar Cake! I recently started my own food blog and am loving how much fun it is to write about my food and experiences! Way to go on the cake and Congrats! Thanks! To be honest, Pinterest gave me the directions, I just followed! 🙂 Baking is sort of a hobby of mine. I love making people happy with dessert! That cake sounds so cute! I have pretty much been unsuccessful in making cake into shapes, so I just try to find funky flavors that people don’t expect. I hope your food blog goes well! I love reading food blogs and re-pinning the recipe photos! Baking is the best ever!